I played in an enjoyable game of Warlord's Black Powder hosted by one of the best painters in the local area. (his blog http://wabcorner.blogspot.com/). 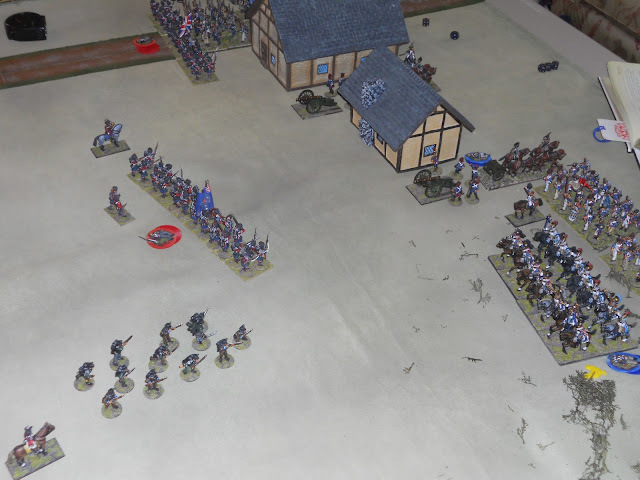 The scenario was designed around one in the book, Fighting Retreat from El Perez. 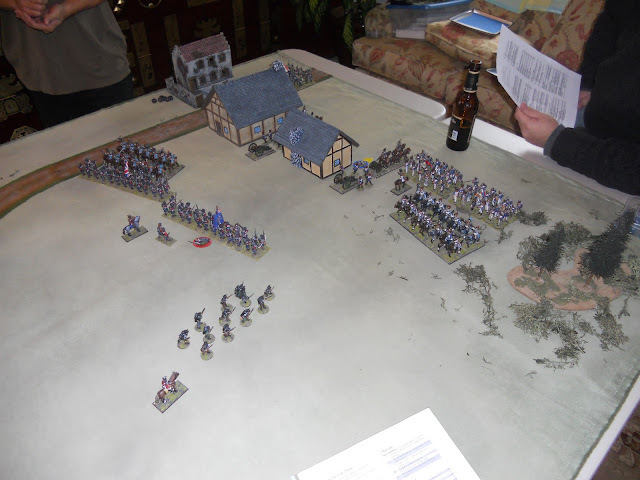 The initial setup had the British/Spanish on the table. 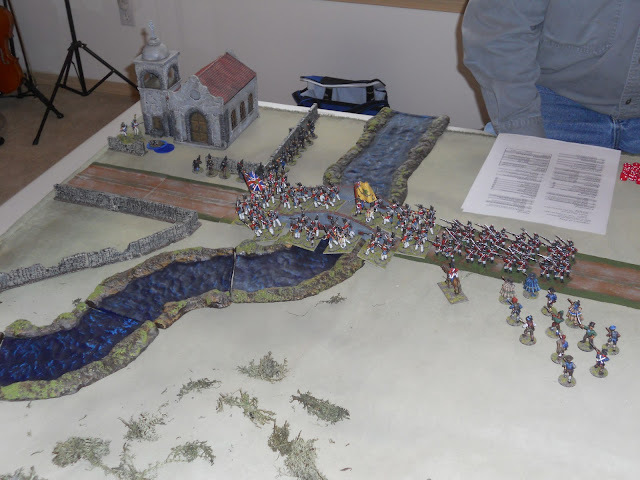 The British mission was to get half of their forces across the bridge in the upper right corner, before a superior French force comes on to the table and defeats them. The British decide to split their force and send half immediately across the bridge and leave the other half behind to sacrifice themselves and give time for the crossers to cross. The French had a unit of Voltigeurs near the bridge to slow the crossing. About a quarter of the French make it on the table and most just stand around ignoring orders. 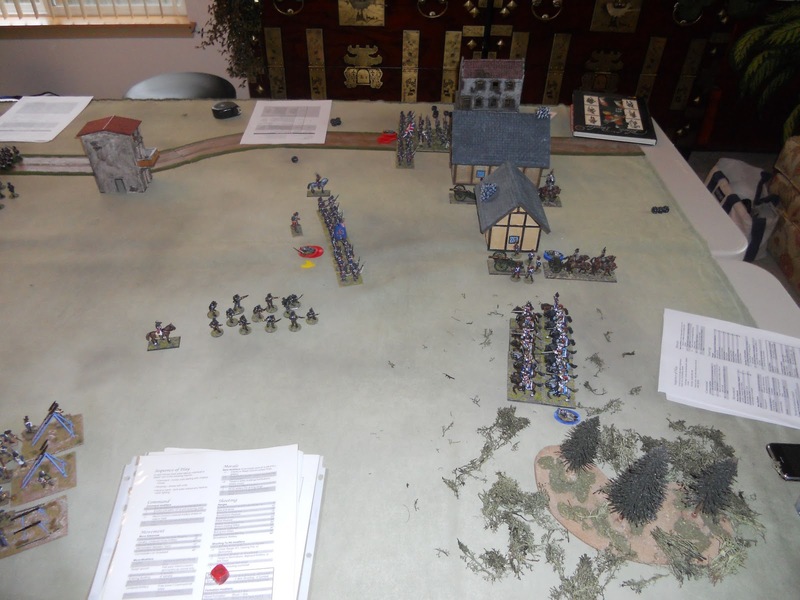 A unit of Hussars charge some Highlanders to only be defeated, run away, and leave the table. The French are doing so bad obeying orders, the British begin to advance in order to acquire the gigantic beer that magically appears on the battlefield. 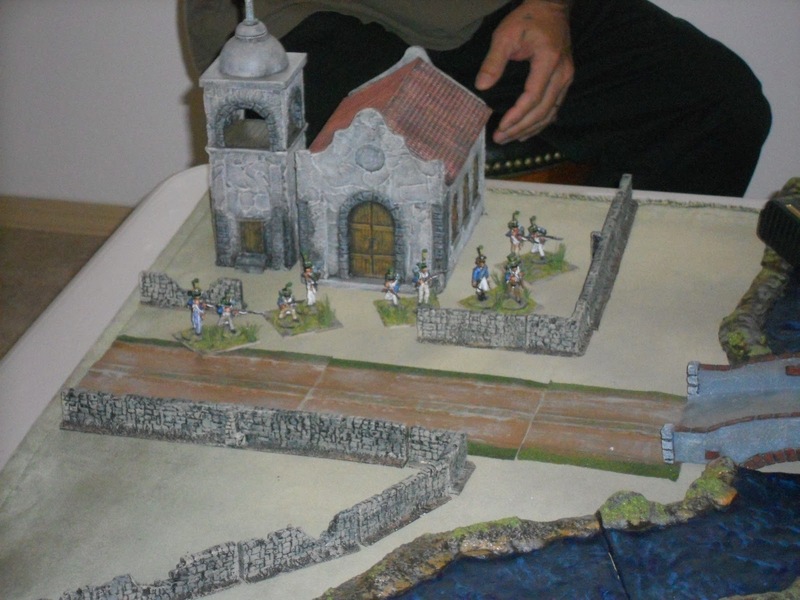 Meanwhile the British jam up at the bridge and pour lots of ineffective fire into the church where the Voltigeurs are now hiding. The French can't seem to get their horde on the table. Those on the field, continue to stand around and slowly lose the battle. Rockets and lucky rifle fire ruin their morale, while the two units of Highlanders start stomping all over the few French obeying orders. The French finally decide to do something as almost all their forces fail taking orders and run off the table. The Heavy cavalry just sit there and take casualties. Everyone agrees the British won easily, but technically I believe the French did. The British generals miscounted and ordered one to few units to cross the bridge. It's the first game of Black Powder I've played and I hope there are many more. It was very fun, even for the French generals who need to throw their dice away. Excellent phots looks like a great game, I've not tried Black Powder.....yet!! The game looks very good. Nice photos. Good looking game, I like the beer and gaming rule, will have to speak to the Rejects about it. Very nice report and pictures. Thanks for sharing!